CHICAGO (WLS) -- Illinois State Police responded Thursday to an ABC7 I-Team report about a proposal that could hide forensic failures occurring at the state police crime lab. In a written statement, the agency denies the legislation is intended to cap or limit lab information. "The ISP endorsed Amendment #3 to SB3096 to ensure the integrity and consistency of lab toxicology reports presented to the courts and to not limit disclosure," according to the emailed response. The ISP also states, "These administrative rules are designed to provide a minimum standard for compliance of toxicology evidence and is not intended to limit the production and discovery of material information." Last fall, the I-Team reported about a culture of law and disorder at the Illinois State Police crime labs. We obtained internal audits and reports that revealed blood and urine testing errors and bad testing methods that jeopardized criminal cases. Now, legislation headed to Gov. Bruce Rauner would allow state police officials to make up their own rules and keep such information from defendants and the public. "It's a sheep in wolves clothing," said Wheaton defense attorney Don Ramsell. Ramsell regularly subpoenas test results and data from the crime lab when he defends motorists charged with drunken driving. Under the legislation passed by the Illinois House on Tuesday, Ramsell says state police will be able to withhold some of the most crucial crime lab information, including, he says, the kinds of mistakes uncovered by the I-Team last year. 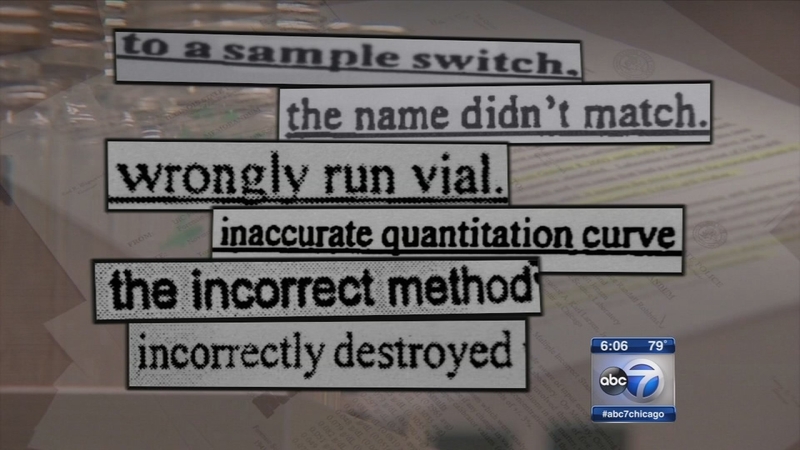 These mistakes included: test samples switched, names that didn't match, wrongly run vials of evidence, general inaccuracies, incorrect methods and destruction of evidence. "It's an attempt by the Illinois state police crime lab to try to limit the amount of information they have to turn over to the defense. This way they can hide whatever mistakes errors or method problems that you and the I-Team discovered last year," said Ramsell. The forensic failures discovered by the I-Team last fall appeared to put criminal cases in jeopardy and raised the possibility that charges and convictions would have to be thrown out due to faulty lab tests. But the legislation headed to the governor's desk would allow state crime lab officials to insulate themselves from future failures. Ramsell says they will do this by keeping the information under wraps. "The purpose of the law is to prevent the defense attorneys from getting any of the information we have been able to get in the past. They are going to try to set up rules so the mistakes and errors don't become the types of information they have to turn over any more," said Ramsell. Ramsell says this would be the first law in the U.S. Allowing a police crime lab to decide what information to provide to defendants and attorneys. No word yet how Gov. Rauner looks at this, but the bill will be on his desk.